The material surfaces of towns and cities index legal, civic and corporate influence. With rampant privatisation these last two seats of power coalesce into a regime that proposes and propels corporate capitalism as the only socio-economic option available. 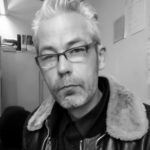 Adrian Burnham has a long held empirical interest in both the variety and efficacy of interventions on urban space and a particular fascination with paper-based art and visual activism. His career spans both a mundane engagement with the metropolis – as a commercial flyposter in the 1980s and 90s – to more academic study of the city and the social production of space at Goldsmiths University. After 10 years leading courses and lecturing on art and design at Hackney Community College, in June 2016 he founded and continues to curate www.flyingleaps.co.uk: a street display and online platform for socio-politically engaged artists. However, in the UK and elsewhere, recently we’ve seen a substantial and growing number of people hungry for analyses of the flaws of neoliberal governance. In ways that were almost unimaginable even a year ago, a contemporary democratic socialist and/or communitarian conscience appears to be gaining traction. Although, in this era, when it is perfectly possible to imagine oneself connected and active without ever leaving the purview of a screen, ‘real’ or material, physical interventions calling for social conscience, needling for change or simply helping viewers to see the world afresh can take on enhanced significance. While corporate culture continues its creeping grip on education, health, the news, entertainment and our personal and collective consciousness, opportunities to express views outside the narrow confines of the established political order are diminished. And it’s the multiplicity of voices, tactics, the range of visual languages employed as well as inventive siting and enactment of art and visual activism that lends it a strength, that affords it a much better likelihood of breaking through, effecting a publics’ concerned awareness – publics plural because urban dwelling is an agglomeration of many ideas and mentalities – arguably sometimes even to the extent that visual engagement translates into action. Whilst I think some work on the more radical end of the art/visual activist spectrum is brilliant at skewering government wrongs or exposing corporate cant and abuses of power, what the activist art rebels have to do – and I know the best do this constantly – is consider the efficacy of their message. Is it managing to get anywhere close to reaching those who are not already persuaded? Humans for the most part are not simplistic. We thrive on and evince a multitude of ideas and practices. Take, for example, the Artist Taxi Driver (aka artist/activist Mark McGowan): his practice consists of serious sociological interviews, comical interventions, vituperative rants, practical support and involvement, collaboration with popular music and producing ‘naïve’ watercolours (which themselves are incredibly varied)… The point being he is all these things (and more besides) and we’re all, for the most part, similarly complex. That’s why the critical visual art we make needs to appear in various forms, work in various ways to at least have the potential to affect us in differing registers. American architect, urbanist, writer and teacher Keller Easterling (2014) observes in Extrastatecraft that the declarative and enacted approaches to activism are to an extent bound together and complimentary. She cautions, however, that too glib a reliance on any declarative ‘us versus them’ rhetoric completely misses the mark in terms of effective dissent in contemporary political work. Worse, it plays into the hands of excessive power and wealth because more and more the means by which the ‘1%’ maintain control is extremely sophisticated. ‘Righteous ultimatums or binaries of enemies and innocents that offer only collusion or refusal might present a structural obstacle greater than any mythical opponent’ such as Capital, Empire or Neoliberalism. Adopting merely a simplistic oppositional stance lets big business, government and the sophisticated mechanisms of global capitalism off the hook. Many powerful players that […] activists oppose maintain fluid or undeclared intentions by saying something different from what they are doing. It is easy to toy with or trick activist resistance if declaration is all that qualifies as information. When targeted, the powerful wander away from the bull’s-eye, arranging for shelter or immunity elsewhere. They may successfully propagate a rumor (e.g., that there is evidence of WMD, that climate change is a hoax, that Obama is not a US citizen) to capture the world’s attention. Capturing attention to divert attention. Vested interests are ever cloaking themselves in the mantle of resistance. The commercial construction sector negotiating to build quotas of ‘social housing’ – inadequate in the first place or, as we’ve seen recently in the fallout from the tragedy of Grenfell Tower, a blatant con – or the thrust to privatise services, schools, the pushing through 24/7 of access to health is ideology in the guise of reform. Mainstream media plays the same surreptitious game. Witness, for instance, the cynical volte-face of a Murdoch press now loudly ‘supporting’ breast cancer awareness. Leaving open the question as to whether and how directly socio-politically engaged art and visual activism speaks to social justice, what does occur from time to time is a work – image, text, installation, T-shirt, performance, street poster… – can challenge and even help to alter the public’s disposition. Here, in part, resides the value of turning our urban environment into a platform for artists: it’s an opportunity to visually delight but also a chance to question, maybe even shift shared beliefs, ideas and ethical concerns operating across society.